For MageRewards to be usable, its display components must be available to customers who are visiting the front-end. To offer maximum flexibility, store administrators can decide on where and how these components are visible in the front-end through injection of some code into Magento's design files. The integration guide will walk you through this process. As of MageRewards 1.5, we offer a standard way to have the display components integrated into the front-end without having to inject any code into the files. This doesn't offer a lot of flexibility, but if you'd like to get MageRewards up and running as fast as possible, this feature can come in very handy. To do a manual integration,some code will have to be injected into Magento's design files. If you're having any problems you may want to check out the Integration Troubleshooting section. Copy ONLY the files you wish to modify into the exact same folder structure as they appear in the base/default directory. 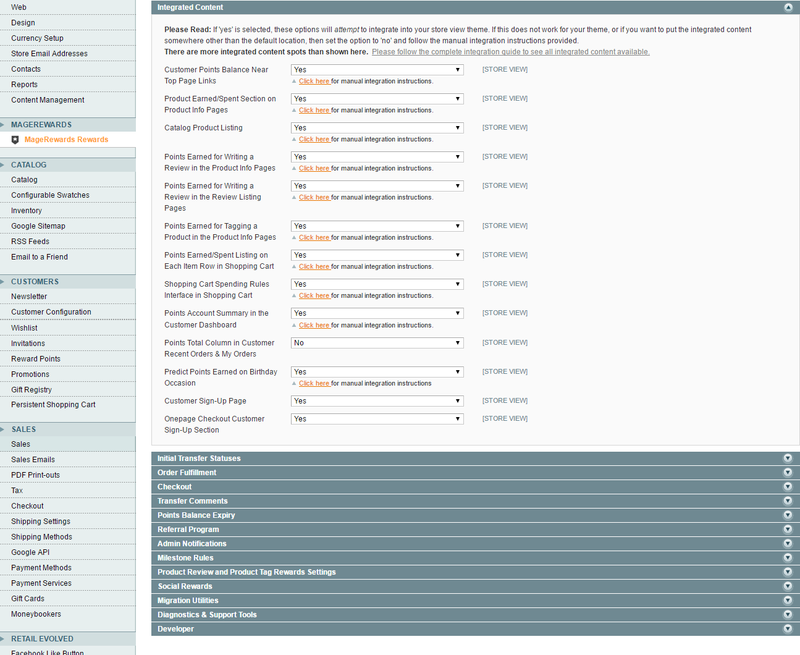 Set your theme in Magento by going to System > Configuration > Design in the admin main menu. If Magento cannot find the phtml files in the default/<your_theme> directory it will automatically check the base/default directory. In order to gain the full benefit of your MageRewards rewards program on your store, we have added these steps that will integrate certain aspects into your own store's custom design. You don't have to do all of these. Instead, we recommend that you only do the ones you need/want. Customer: Order view for Magento 1.3 stores. Magento 1.4+ stores will automatically show points in the customer order history view. An useful tool that many Magento designers use is template path hints. It is available from the back-end. It helps you discover what phtml file is loading in each template block. This can help show you what file needs to be customized moved or replaced. You might find these unrelated design guides also helpful for setting up the integrated design in your store. Display 100 TOKENS instead of 100 TOKEN POINTS, or other points display changes. Customize product view - "You will earn X for buying this product"
How do I remove the send points to a friend feature? How do I remove the redemption catalog? Customizing and showing the points slider.